Metronome touch. Style of pendulum. Creating Metronome touch came with one objective: design a gorgeous metronome that gain style of pendulum, perfection in accuracy, and let you interact within more intuitive and realistic ways. Made ofÂ aluminumÂ and glass, Metronome touch proves a huge statement: It is as exclusive as your device. Launching Metronome touch, your device will become a metronome. Anyone can try to make a metronome app. But success only comes within listening to customers. Thats why Metronome touch centers customers favored functions: The ability to tap a beat, use customizable presets to save your favorite sets (bpm, time signature and accentuation), and multiple useful ways of adjusting the bpm. Metronome touch even goes far beyond that: Neither analog nor digital metronomes can synchronize pendulums. Metronome touch does. This opens completely new ways for practicing, performing on stage or studio recordings. As musician teaching people, a group can follow your lesson more exactly while concentrating on their own device with Metronome touch. You also gain student attention in using this outstanding technology. If you have ever been on stage with bad acoustics you will love Metronome touch: It will provide every single band member a perfect steady and synchronized measure on stage. Even recording a song in separate soundproofed rooms, Metronome touch keeps you in perfect sync. Easily suit Metronome touch to your likes and needs with including four beautiful designs - high resolution retina display graphicsÂ - and well chosen professional metronome sounds. Metronome touch daily questioning its own statement. Thats why its constantly being developed to ensure highest customer satisfaction. 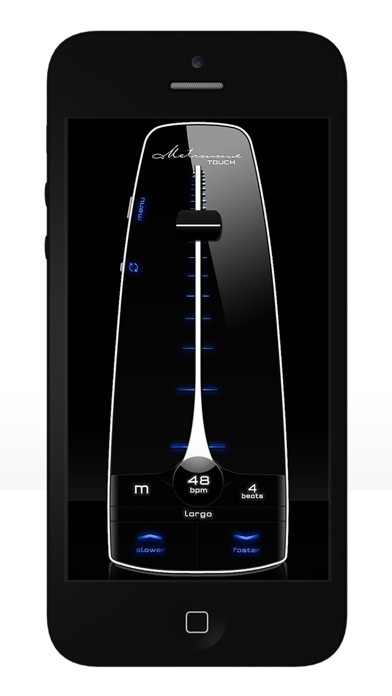 Completely new developed engine makes it one of the most precise pendulum metronomes available on the App Store. Highest accuracy on all supported iOS devices. â€¨Metronome touch is the first metronome worldwide offering pendulum synchronization with iOS devices! Keep bandmembersâ€˜ metronomes or a whole orchestra in sync. â€¨Four customizable presets to save your favorite sets of bpm, time signature and accentuation. â€¨Tapping bpm display once letâ€˜s you directly enter tempo values from 15 up to 210 bpm. Double tap the bmp display to access the tapfield that will interpret your fingertaps as bpm. â€¨Choose beat count from 1 up to 12 beats and free customizable accentuation. â€¨Suit Metronome touch to your likes and needs. Choose between four beautiful designs and well chosen professional metronome sounds. â€¨Metronome touch comes with high-resolution grafic for retina display and looks simply perfect on your device.